The word ‘truck’ conjures up imagines of a vast industrial landscape, inevitably based in the North of England, where huge factories churn out plumes of billowing smoke and every building carries a dark grey hue… So much for the Hollywood image; today’s industrial towns and cities are vibrant places, often bright and clean. I live in a town known as the “Industrial Garden Town of Britain”. It’s a steel town, and every day the roads are full of trucks flooding in and out of the steel works with goods in and out. 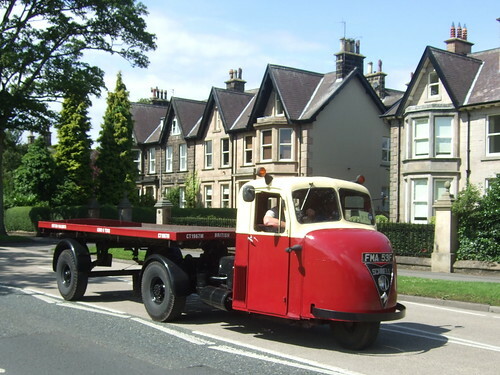 Gone are the days when the steel works owned and managed a huge fleet of its own trucks. Today all logistics operations are subcontracted to a large number of specialist firms around the town. If your company conveys large quantities of raw materials to the UK’s remaining heavy industry, appropriate truck insurance will ensure that your vehicles are covered against any number of potentially catastrophic eventualities. The UK’s motorway system is strained to the limits with overuse. This is inevitable with such a large population in such a small country. As a trucking firm, the motorways are the veins carrying the blood of your logistic operation. A recent accident on the M1 caused hour-long tailbacks and significant delays for drivers behind the accident. A truck had somehow overturned and its load of concreting lime was smothered all over the tarmac. This is a nightmare scenario for any logistics firm. Not only was the load undelivered but the raw material was all over the motorway. Finding an insurance policy to cover this type of problem needs to be a consideration if your firm hauls heavy raw materials between sites. Not only do you have the cargo and time elements to worry about, your poor driver may well be injured, your truck damaged and you’ll be handling a huge bill for the clean-up operation. Truck insurance policies are available that will offer cover for all of this, including compensation against the personal injury of driver, loss of load and related clean-up costs. It is also worth considering decent legal cover for these situations as you may well find yourself claiming against uninsurable losses in a non-fault accident. As will all commercial vehicles, the name ‘truck’ can be interchangeable with ‘lorry’ or even ‘LGV’. Some insurance companies will meet your specific truck requirements although selling their policy as under lorry insurance. It’s worth doing a comprehensive search to make sure all the angles and variations are covered.